It was SO nice to have them all over. We enjoyed turkey and dumplings, boiled dinner, salad with ginger miso vinaigarette, and some kombucha! One of our friends left me some wool roving to try out! I didn’t even have an official drop spindle yet – but I knew Joel would make me one. And right away, he made me a really fun one with a cross section of maple. He will be making several more with a little more fun added and we’ll be listing them on Etsy sometime in the future. Oh, Etsy? Yes, we are planning to start there again. We might move into another selling option eventually, but we will start with the store we already started. I’m not sure the extent of what will be listed, but I’m sure some of these drop spindles will be found there. I love this cutting board! I’m in LOVE! And I love working with this roving – which I won’t be producing with my angora wool. Angora wool is much finer than this and since I plan to use cotton/wool cards, I'm not sure I'll have such wonderful long roving to work with. They would be a bit longer with a drum carder - but those aren't necessary for me yet. I'll be making small rolags to spin together. If you want to spin with a drop spindle, I highly recommend these three videos to get you spinning: Drafting, Spinning, and Finishing. Here’s how I’ll be prepping my angora wool - Youtube on how to make rolags with wool cards and angora fiber. And here’s a youtube on spinning with rolags of wool. And this is a really cool old history and tutorial on making rolags. Spinning was so relaxing and wonderful. No thinking – just doing. Well, there is thinking – but I wasn’t adjusting a recipe in my head, or preparing for a cow, or reading a book, or taking notes, or having in depth discussions. Those happen SO often here on our homestead that I’ve been having a hard time shutting it off when it’s time for sleep! To relax, we’ve been playing cards – but that’s not Joel’s favorite thing to do. This might fit the bill perfectly. A little spinning every night might just do the brain some good! The thickness of the green on the left is how the purple on the right started. I quartered the one on the right. It still needs to be drafted further and pulled thinner. After drafting, I spun some on the drop spindle. and hanging it to dry with a weight: aka Joel's pliers. So what have we been thinking about? Well, just a few things, really. But they are fairly involved and I have to remember a bunch of stuff at the same time I’m learning about one thing. I’m still thinking a bit more about placement of blueberries, raspberries, elderberries and strawberries. And I’m reading a little on how I could help the pear trees and peach trees here with companion planting. So I’m still in the Carrots Love Tomatoes book and considering different options, but I’m not in a rush anymore. The garden seeds have shipped and they are on their way. I can wait a little to put in my order for fruit and potato tubers. And I’m also prepping for Buttercup’s calf next month. If you follow on facebook, you’ll know this one kept me up late one night last week when I had a crazy moment and was SO excited and freaked out at the same time that a calf would be here so soon! Keeping A Family Cow is one of the most informative and complete book I’ve ever read on any subject. It’s seriously easing my mind and making me feel like I can actually BE prepared. I’m now waiting for a Jeffer’s catalog to come in the mail so that I can see what they have and see what I’d like to order. I’ll probably get some CMPK gel for early intervention in case of milk fever. The rest of the list needs a little more research. So I’m just going to keep reading. 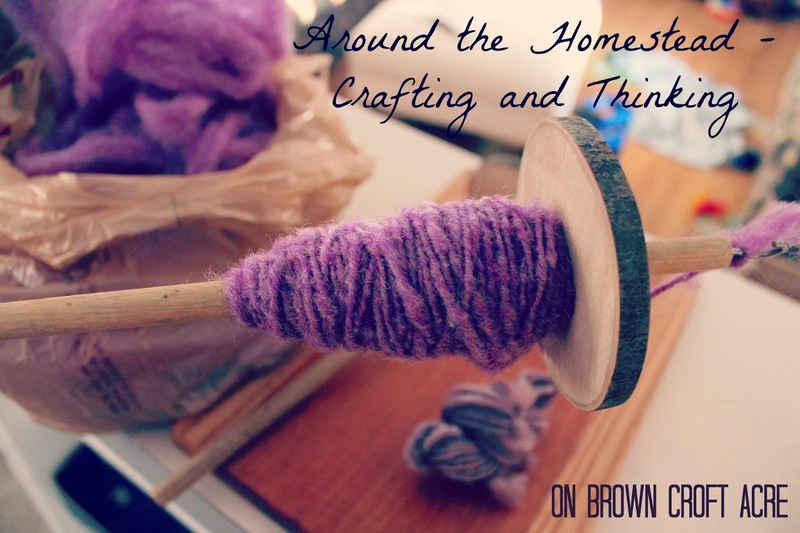 So happy to be crafting and thinking on Brown Croft Acre. It was a pretty fun weekend here. What fun did you have this last weekend? It was a nice weekend. And thank you. My second spinning didn't turn out as well, but the roving was so different to work with. It's fascinating. I'm excited to get to work with our angora soon! Thankful Thursday - the people in this house. Why this picture is scary.